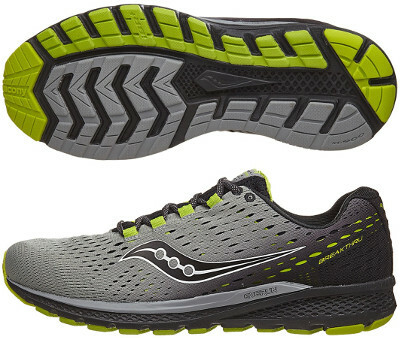 Saucony Breakthru 3 are neutral performance running shoes. The completely renovated Saucony Breakthru 3 keeps its name so general public can easily identify it but has been changed from top to bottom. Still fits in "classical" concept of performance shoe (great response, firm cushioning and 8 mm drop), just one step below Zealot ISO 2 and popular Kinvara 7. It is a perfect choice for race days up to marathon and tempo runs. Upper has little to do with its predecessor Breakthru 2 and uses an engineered mesh which covers internal midfoot support straps for snug fit in a similar way Peregrine 7 does. Several holes of different sizes depending on the area provides great ventilation although raises typical concers about durability, something Saucony needs to get rid of. Midsole in Breakthru 3 also changes featuring full-length EVERUN topsole instead of well-known PowerGrid over reliable SSL EVA foam to improve energy return. Outsole design develops Saucony's extended TRI-FLEX configuration already seen in premium running shoes like Triumph ISO 3 with deeper grooves to increase flexibility and therefore promote quicker transitions.